Editor’s Note: Michael Carus is a physicist, and founder of the nova-Institute, a private institute offering science-based consulting and research services to clients in the bio-based economy, including agrochemical, food, plastics, and consumer goods organizations. Over 20 years since its launch, the work of the nova-Institute has rapidly changed along with breakthroughs in technology and innovation, particularly relating to the production of food. Ahead of nova-Institute’s upcoming food technology conference, Carus talks about the revolution in food and biomass production. How has the work of the nova-Institute changed since you launched in 1994? One new aspect of our work that is very exciting is the CO2 economy, or carbon capture and utilization (CCU). Here we are exploring how organizations can use CO2 directly as a feedstock; i.e. without the detour via plants and photosynthesis. For example, you can now use CO2 to produce proteins and fatty acids with the help of bacteria and algae, which will be a revolution in food similar to the widespread use of insects for protein. Today it is also possible to convert solar and wind energy using CO2 into fuels and chemicals. At the conference, the company “Solar Foods” from Finland will present the first commercial proteins produced from CO2 and renewable energy on a session about alternative protein sources. What are some significant changes in the bio-based economy since you founded the nova-Institute? The bio-based economy is now an integral part of the circular economy, whereby all waste streams of the food and fuel industry are used to produce other materials such as fatty acids or biofuels or chemicals and materials. Nothing will be lost with the efficient and sustainable use of biomass in a circular economy. This full integration of the food sector with its main and secondary flows is relatively new. One example is the dairy industry, which can use its wastewater for the production of bioplastics that can later be used to package butter and cheese. Even more important are new natural products: with new biotechnological processes, bacteria and fungi can produce high-value natural nutrients, flavours and pharmaceuticals in a very cost-efficient and sustainable way. Until now, such products were mostly made from crude oil or from expensive plant components. Now there is another natural way: biotechnology. For example, bacteria or fungi eat sugar to produce high-quality biomolecules that are 100% identical to those from plants but much cheaper to produce. The interest in these innovations is very high in the food and pharmaceutical industry. Considering your background in alternative energy and natural resource replacement, what role do you think the agrifood industry can have in reducing carbon emissions and reversing climate change? Is it realistic that farming techniques and the use of technology can have a demonstrable effect on the carbon footprint of the agrifood industry in the next 10 years? A very important question! The food sector has a lot of catching up to do in terms of sustainability and life cycle assessments. While comprehensive analyses of environmental impacts have been carried out for decades in the field of bio-based products, we know little about the different footprints of foodstuffs. This work is picking up speed at the moment. Numerous new agricultural technologies such as precision farming, digitization, and biostimulants have the same goal: less input, more output with less environmental impact. It will soon be possible to achieve the same yields with 20-30% less use of fertilizer and crop protection, with skilful management. This leads to a significantly lower footprint! Why did nova-Institut launch the REFAB event? We see ground breaking innovations in nine areas of food and biomass production. 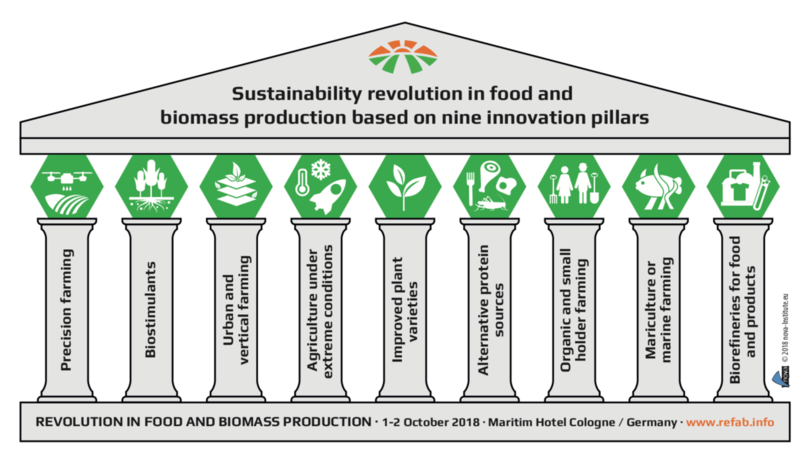 Each of these areas has its own conferences, but it is only in their combination that the synergy effects we call “Revolution in Food and Biomass Production” become clear. And there has never been a conference that brings these areas of innovation together in one place. This will lead to completely new networks and innovation ideas. Which of the technologies set to be discussed at the Revolution in Food and Biomass event excite you the most a physicist? Oh, there are so many: artificial intelligence will enable direct communication between plants and robots, biostimulants will no longer work against but with nature once we have finally understood the close connection between soils, fungi, bacteria and plants. The simultaneous use of land for agricultural and solar energy is fascinating. And also the fact that today we can produce healthy food in cities, in the desert and even in space through controlled environment agriculture is a revolution in food industry. Controlled environment agriculture can also use the marine environment much more efficiently and sustainably than today. What do you hope attendees will take away from the conference? Lots of ideas, inspiration and new contacts and networks. Many developers and pioneers will be fascinated by what happens in neighbouring areas they have so far overlooked. This can lead to completely new innovations. I would be particularly pleased if smallholders and organic farmers could also take up new technologies that make cultivation more efficient and sustainable without having to abandon their principles. Find out more about the Revolution in Food and Biomass Production event in Cologne, Germany here.